softwall + softblock modular system is a freestanding partition system that can be expanded and contracted to freely shape intimate space within larger interiors. Utilizing flexible honeycomb structures that expand, contract, and flex, softwall can be opened from 4.5cm (2”) to 4.5m (15’) in length, or smaller dimensions as desired. The elements of the soft collection have been designed to be uniquely shaped for a specific occasion or space, folded away for storage, and/or reshaped again in variable and dynamic ways. modified textile softwall + softblock are made from a newly developed non-woven polyethylene that has the texture of soft, toothed paper. The material’s white, vellum-like translucency allows light and gently abstracted silhouette to permeate softwall + softblock’s rhythmic structure. 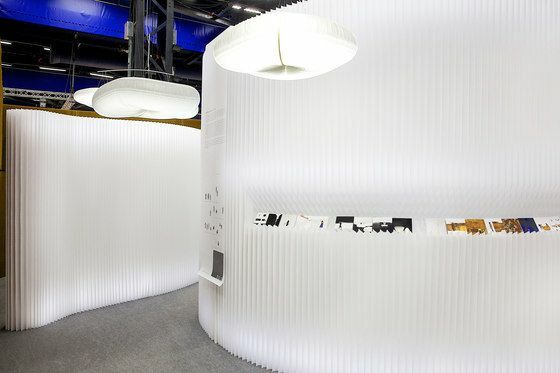 white modified textile softwall + softblock can also be integrated with molo’s LED lighting to create flexible, luminous partitions. molo’s textile material is tear, UV, and water resistant; has an M1 fire rating; and is 100% recyclable. modified textile softwall + softlbock are available in standard and custom heights up to 3050mm (10’) tall. All elements in the softwall + softblock modular system can connect together with concealed magnetic end panels in an almost seamless way, as vertical joints between elements blend with the rhythm of their vertically pleated structures. The integrated magnets can also anchor softwall + softblock to any steel or magnetic surface. softwall + softblock are available in other opaque and translucent paper and textile variations, with multiple colours (and custom colours) available. Recognized for poetic beauty and pragmatic innovation, softwall + softblock has received numerous international awards and have been acquired into the collections of museums and galleries worldwide including the Museum of Modern Art (MoMA) in New York. softwall + softblock modular system forms the core of molo’s innovative and award winning soft collection of expandable/compressible furniture, lighting, and space partitions created from flexible paper and textile honeycomb structures.